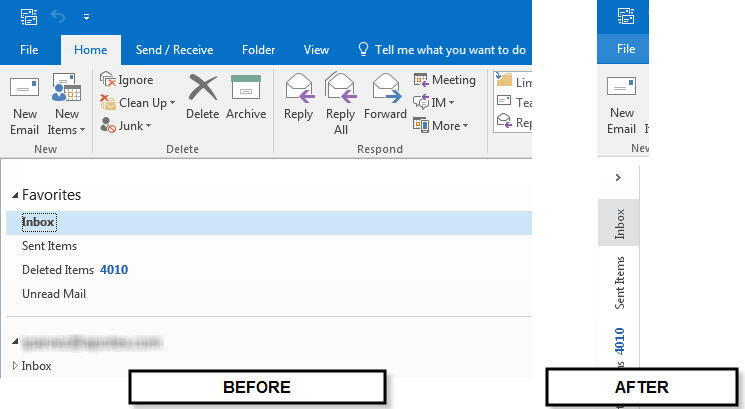 If you recently upgraded from an older version of Outlook, you will notice that the navigation pane which shows your Inbox, Sent/Deleted Items and the Archive folders, has compacted and require you to click on an arrow icon to expand the navigation pane. Though useful, if you are not a big fan of compacted navigation pane, this article will discuss how to remove compact navigation in Outlook 2016. The image above shows the full navigation pane which was the default setting for previous version of Outlook and the new compacted pane shown on the right. The reason why you may want to go back to a full navigation pane is because it gives you quick access to various folders including Archive folders with a single click. In addition, the full navigation pane gives you quick access to sub folders under parent folders. Place your mouse on the borderline of the navigation pane. The mouse pointer will give you an option to resize the pane. Click and drag the border to the right to your desired navigation pane size. Release the mouse. The navigation pane will come out of compact mode and show full navigation.